You are buying the Forma Full Face Mask Foam Cushion Extra-Large 400HC014 CPAP, manufactured by Fisher & Paykel. Fisher & Paykel is a leading manufacturer of CPAP machines and CPAP accessories. At ADW Diabetes, we offer the complete product line by Fisher & Paykel with great savings and excellent service. You are buying the Forma Full Face Mask Foam Cushion Extra-Large 400HC014 CPAP, manufactured by Fisher and Paykel. Fisher and Paykel is a leading manufacturer of CPAP machines and CPAP accessories. At ADW Diabetes, we offer the complete product line by Fisher and Paykel with great savings and excellent service. The Forma Full Face Mask Foam Cushion Extra-Large 400HC014 CPAP is a replacement foam cushion designed in combination with the Forma Full Face Mask. You are only receiving the foam cushion piece, the piece that makes facial contact around the mouth. The foam cushion is responsible for providing a sure seal. 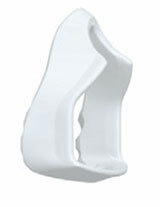 Moreover, the cushion helps in creating a greater range of movement for the patient while receiving sleep apnea therapy.